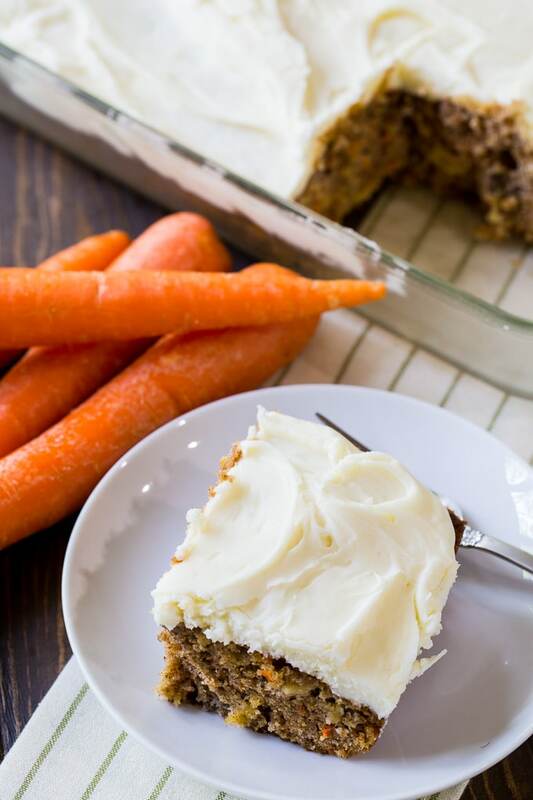 Pineapple Carrot Cake is super moist and has lots of spice flavor. Made in a 9X13-inch pan, it’s easy to cut into squares and share. The cake is covered in a rich and creamy cream cheese icing. 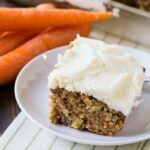 Pineapple Carrot Cake makes an awesome Spring or Easter cake. This cake is plenty sweet with lots of cinnamon, nutmeg, and ground clove flavor. I also add a few chopped pecans to the batter but you could leave them out or use walnuts instead. What’s great about this cake is there’s no electric mixer needed. Just 2 bowls and a whisk. Crushed pineapple is used for this recipe. 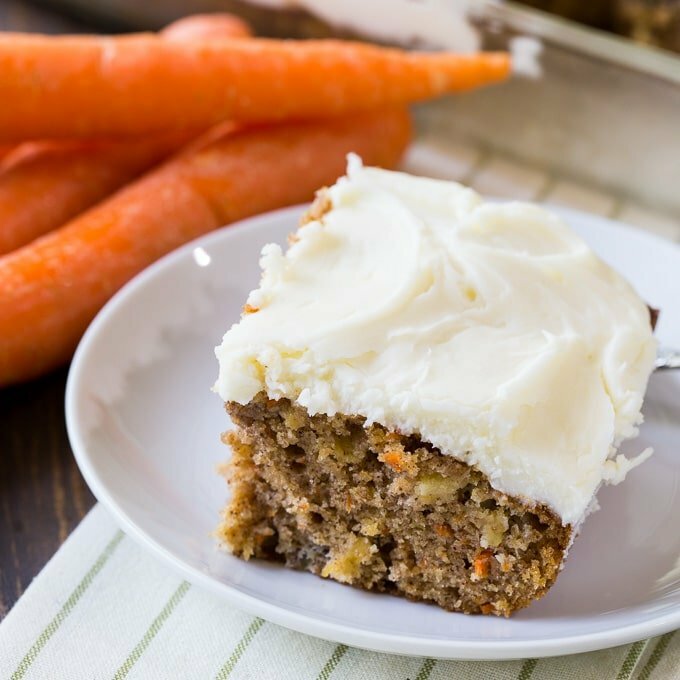 It gives the cake a little extra flavor and adds moisture, but doesn’t change the texture too much. 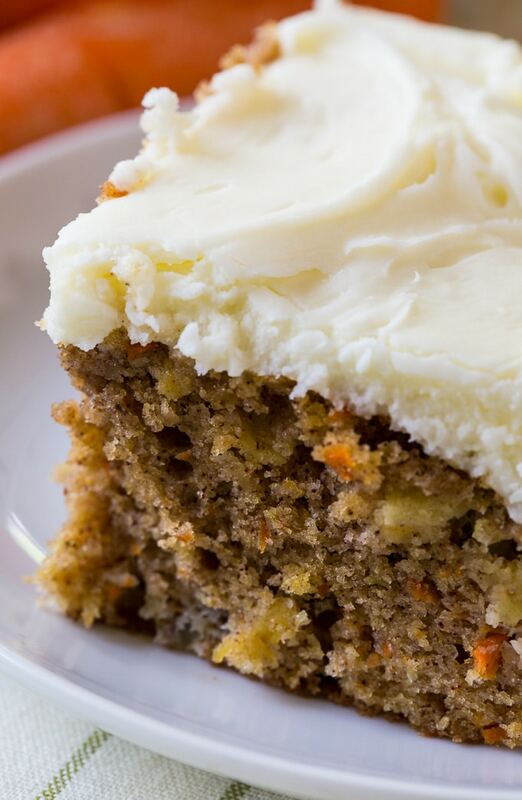 If you’re looking for an easy, delicious Easter cake, this Pineapple Carrot Cake is it. 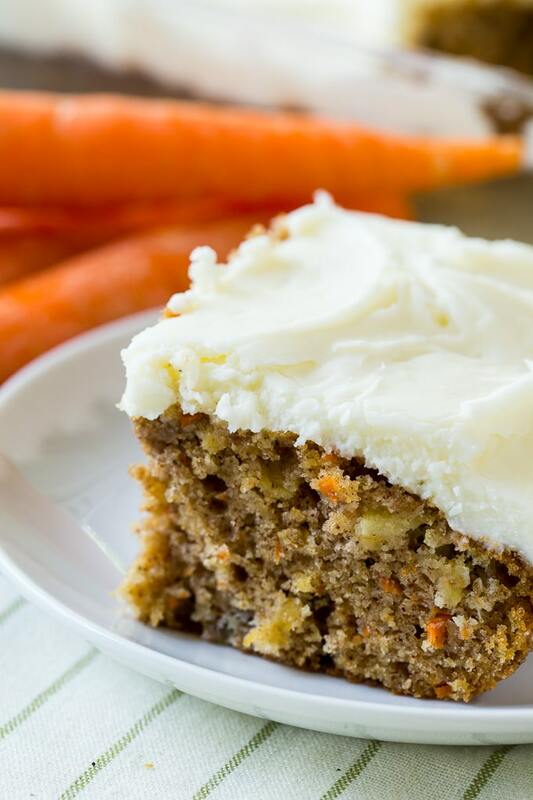 Pineapple Carrot Cake is super moist and has lots of spice flavor. Made in a 9X13-inch pan, it's easy to cut into squares and share. The cake is covered in a rich and creamy cream cheese icing. In a large bowl, whisk together flour, baking powder, baking soda, salt, cinnamon, nutmeg, and ground cloves. Set aside. In a medium bowl, whisk together oil, brown sugar, granulated sugar, eggs, and vanilla. Pour wet ingredients into dry ingredients. Stir until combined. Fold in carrots, pineapple, and pecans. Pour batter into prepared pan. Bake 40 to 45 minutes. Let cake cool completely. Using an electric mixer, beat butter and cream cheese until smooth. Beat in powdered sugar 1 cup at a time, adding the 2 tablespoons of cream as needed to thin it. Spread frosting on cake. Store in refrigerator. This entry was posted in Cakes, Desserts and tagged carrot cake, Easter, pineapple. Bookmark the permalink. This cake was so easy to make! I am impressed with the number of servings slider that adjusts the amount of ingredients to the selected number of servings. Really cool. I also like that you provide weight and volume measurement, not just a can, jar, or bag of something. I notice that the size of pan remains constant despite use of the slider. Halving the recipe would half the thickness of the batter. The thinner amount of batter would bake faster than the original cake thickness. Halving the recipe and maintaining the thickness of the cake would require a 7.6″ square pan, but 8×8′ would be close enough. Made this for morning tea, absolutely delicious everyone loved it. Definitely make again. Makes a big though.